I started this article weeks ago, but finally a few days ago took my camera to get some pictures of Maria and Lourdes. About a week after we moved in to the house in Alantida Joe and I were sitting out on the front porch catching a few late afternoon rays. Maria our neighbor across the street was taking a walk down our street. She smiled and I walked out to the road to meet her. 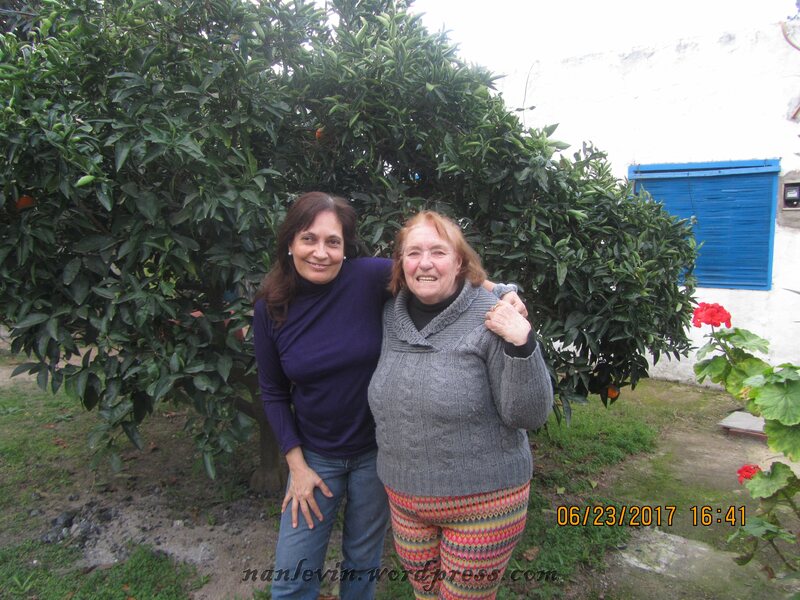 She does not speak one word of English but has been wonderful in telling me about herself, her family and this neighborhood. She has lived in the house across the street for 35 years and in this area for 45 years. Her husband was a contractor and built many of the homes right on our block including theirs. Sadly he passed just a few years back and Maria is sharing her home with Reina (Queen) her little doggie. A few days later I was outside with my new rake and I was attempting to clean up the pine needles from the yard. She walked over and we started to chat. Then she asked if I like palta – that is what they call avocados here. I told her yes but they had none at the market this week and the ones in the supermarket we so small, very overripe and expensive that I did not buy them. She said she had a tree and invited me over to her yard. Well she has a beautiful avocado tree with some huge fruits and it looks to be the Haas variety which is my most favorite of all the varieties. Then she showed me this little orange tree, again filled with huge fruits and so many on the ground just rotting. 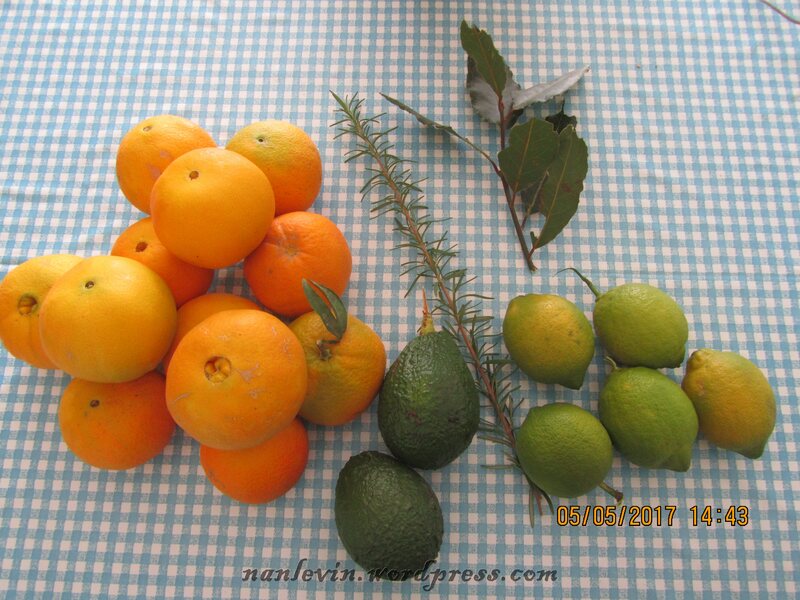 She picked and gave me about 20 oranges – they are Navel, yummy. Also a few lemons they look to be the Persian variety and two beautiful avocados. 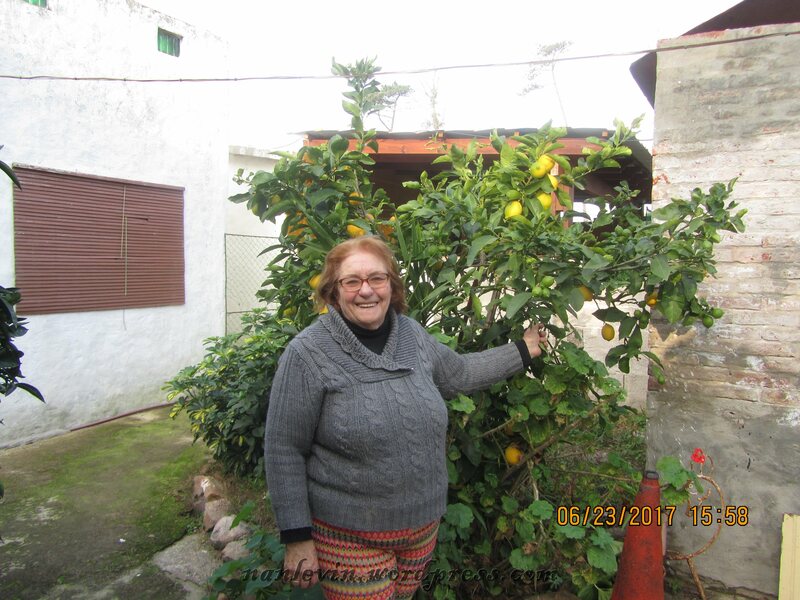 She showed me other fruit trees that I did not recognize the name or the tree as well as a huge gardenia bush in her front yard and a small patch of rosemary. She also had a big bush of Lemon Balm and several tomato plants just falling over with big green tomatoes. As we stood in her front yard she told me that the tree in my front yard was a laurel or bay and so we came over together and picked a few branches she took some to her house and I took a big branch into my kitchen for my next batch of soup or stew. Here is a picture of Lourdes and Maria who have been very kind to us. Maria is as sweet and gentle a person as I have ever met. If I stop by to visit she always has a cup of tea, a cookie or cake to share and loves to talk about her life and family. I wish I understood more Spanish the conversations would be so much nicer if I could completely follow along. What a blessing to have such beautiful neighbors. While food shopping at Disco on Monday I met Jose who said he was 84 years old. He was holding an electric blanket and looked pretty dapper in his little cap. He told me he was a maestro…a maestro of what I never found out. We stood in the one isle for about 20 minutes chatting. He told me about his family many of which live in the US and speak English. Next I went to buy a throw for the bed and there was a women in a wheelchair and her companion a spry gentleman. I recognized her as the women who lives a few houses away around the corner from our home. We also chatted for a few minutes. So far, everyone we have met has been warm and kind. Full of questions and willing to share information on the town, the neighborhood and themselves. From the taxi driver wanting to know how to say our address in English to the young man Frederico at the appliance store, and of course the guys at RedTec from yesterday’s post…everyone has been so very kind and takes the time to ask about us. Un mensaje especial para María: Has sido un vecino maravilloso para nosotros desde que nos mudamos a Atlántida. Su cálida sonrisa, su amable corazón y su amistad son muy apreciados. Ojalá mi español fuera mejor. Ojalá pudiera hablarte más y entender más de lo que tú y Lourdes me dicen. Eres una mujer encantadora, Dios te bendiga por tu amabilidad. 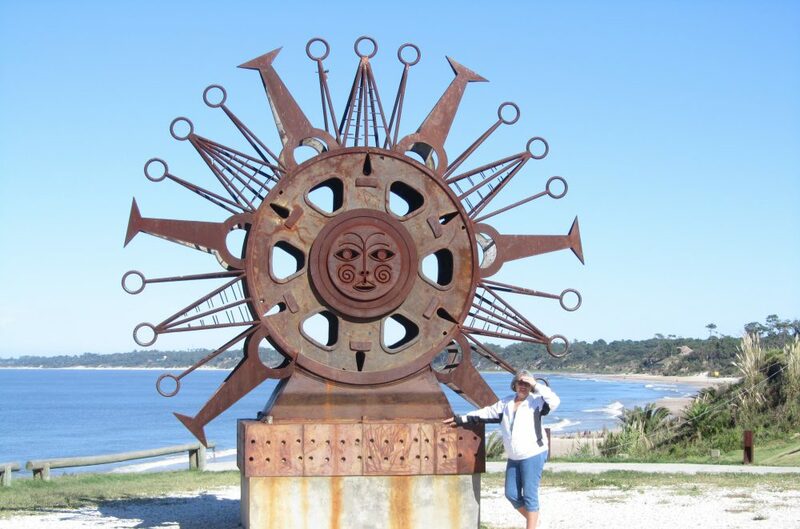 This entry was posted in Atlantida Uruguay, Avocado, Computer, Lemon, Navel Oranges, Paltas, RedTec Informatica Atlantida UY and tagged Atlantida Uruguay, Beach living, Fruit by Nancy Levin. Bookmark the permalink. Hi Mary and John, Yes, most seem very friendly and curious about why we are here. Maria is just lovely. I have met her youngest son and her one grandson. I of course share my soups and different dishes with her and she shares her creations with me. Yesterday she came over with what looked like a cake but it was farina (which is a very popular grain used to make flat bread) stuffed with acelga (Swiss chard) that was chopped with some type of nut inside, topped with a cooked egg between layers of this farina bread, it was sort of like a stuffed focaccia. That was gone in a flash…. that girl sure can cook…. How nice to meet such wonderful neighbours! You are such a warm person though, that you never have any trouble meeting people. It sounds like your move and the new ‘adventure’ are a great success! I loved the special message to Maria at the end. (I had to use Google translate, since my Spanish has slipped badly through disuse – and it wasn’t great to start with). Hi again! Penny says Hi back. Please give our best to Joe as well. Enjoy your new neighbourhood! Sure wish I could see it. How wonderful to meet your gracious neighbors. Hola to Maria!